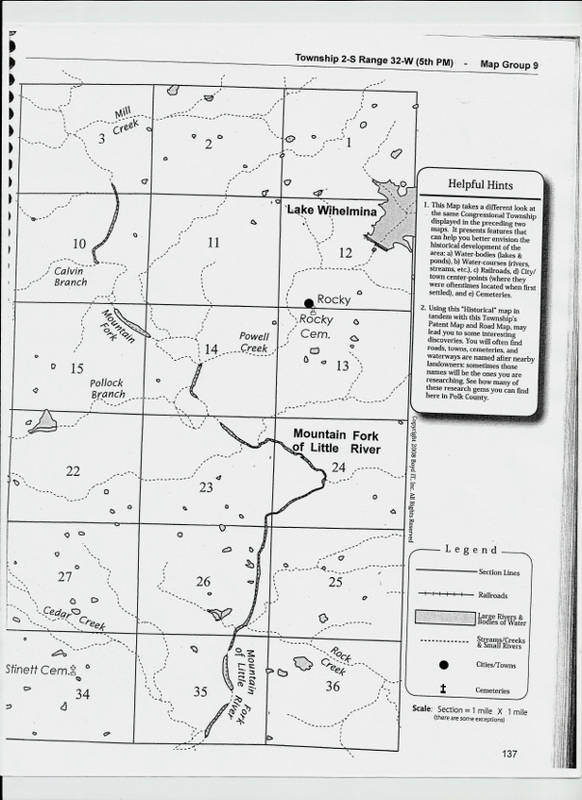 A search through the genealogy room at the Polk County Library in Mena Arkansas rewarded me with plat maps showing the exact locations of Cherokee Homesteaders in Polk County, Arkansas in the 1800s. 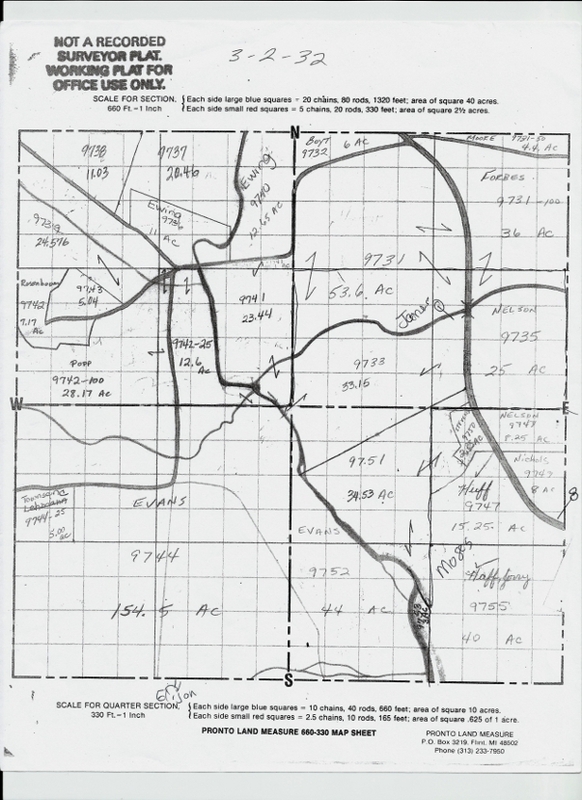 In addition to maps that showed the Township and Range of each homestead, there were maps that showed the topography of the land and maps that showed the county roads. 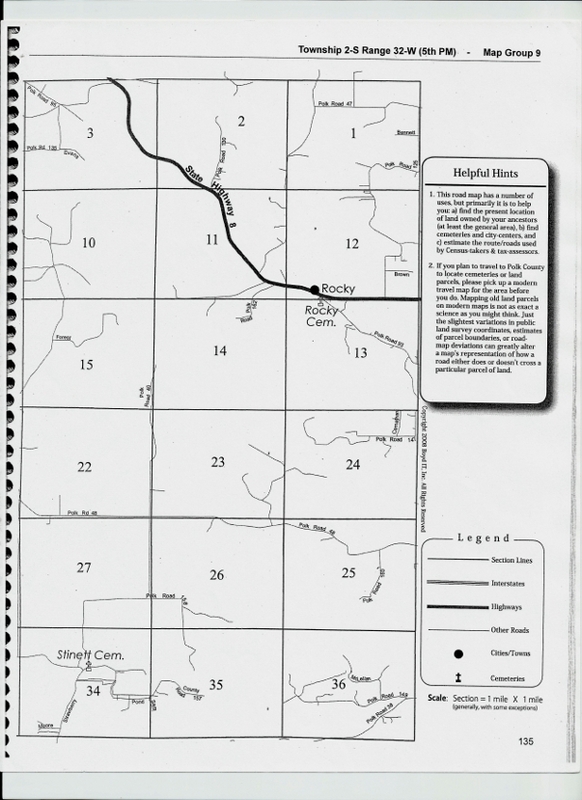 With maps in hand I started driving the county roads of Polk County. Rather than head directly to the site of my great grandfather Moses Crittenden’s homestead which I had driven past that morning, I explored some of the rest of Township 2-S where extended family members had homesteaded. I stopped and took photos of land owned by many of Moses’ Quinton, Winton and Phillips in-laws. My goal was to find a little road marked as Evans, off of Polk Rd 135. It appeared to me that if I drove to the end of that road I would be almost due West of Moses’ land and North of the homestead of Elijah Phillips. According to my plat map listing current owners, the land I was heading towards, owned by Levi N Hill in 1890, was now owned by the Evans family. My goal in driving to the end of Evans Road was to have a clear view of the old Elijah Phillips homestead. My grandmother’s half-brother Anthony Crittenden, son of the Phillips’ slave Emily Crittenden and my great grandfather Moses Crittenden, was most likely born on that land. In two days I would be meeting Anthony’s grandson and great granddaughter in Warner, Oklahoma and wanted to be able to tell then that I had seen where Anthony was born. When I reached the end of Polk Rd 135 I was rewarded by a small sign saying Evans Rd. I headed down Evans Rd, a narrow gravel road with a high center and ditches on either side. In my low riding compact rental, and with no cell phone coverage, I questioned the wisdom of continuing. However, I had not come that far to be put off by a little adventure, in spite of wondering how I would turn around when I got to the end of the road! The road ended looking over beautiful farm land with trees in the distance. I could tell from the compass in my rental car that the old Elijah Phillips’ homestead was straight ahead. It was rewarding to be able to tell my Crittenden cousins a few days later that I looked out over the land where Emily Crittenden and her son Anthony had once lived. To the left was a long dirt road leading up a hill with a new home at the top. I got out of my car to take photos of the land to the south and noticed a man standing on the side of the house looking down on me. Soon he was on a small tractor and heading my way. Luckily the very welcoming current owner of the property was full of questions about how I found out the original owners of the land in the area. I showed him my cover page (which he took a photo of with his phone so that he could do his own research at the library) and explained that I was researching my Cherokee heritage. He was surprised to hear that any Cherokees had ever lived on this land. 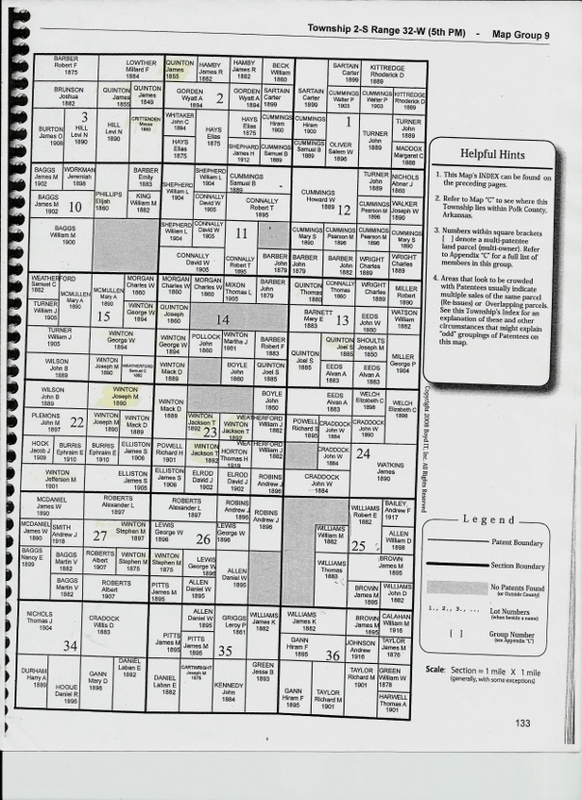 I pulled out my homestead maps and pointed out all the names that I had highlighted on plats that I knew belonged to Cherokee family members. He did not know that any Cherokees had ever lived in Polk County. He had grown up in the area and said it was never mentioned in Polk County history classes in school. Given the denial that I had encountered throughout Arkansas of Cherokees having ever lived in the state, I was not surprised that he had never been taught this history. He was full of questions, as was I. When he saw the number of Quintons that I had highlighted on my plat maps he pointed to a mountain to the east of us and told me that it had always been known as Quinton Mountain and he never knew why (of course, that has been added to my list of things to research). So far I have found very little information. What I did find lists the location as Quentin Mountain, a different spelling from my ancestors. I hope to find more information about how that mountain got its name and whether or not it has any connection to my family. 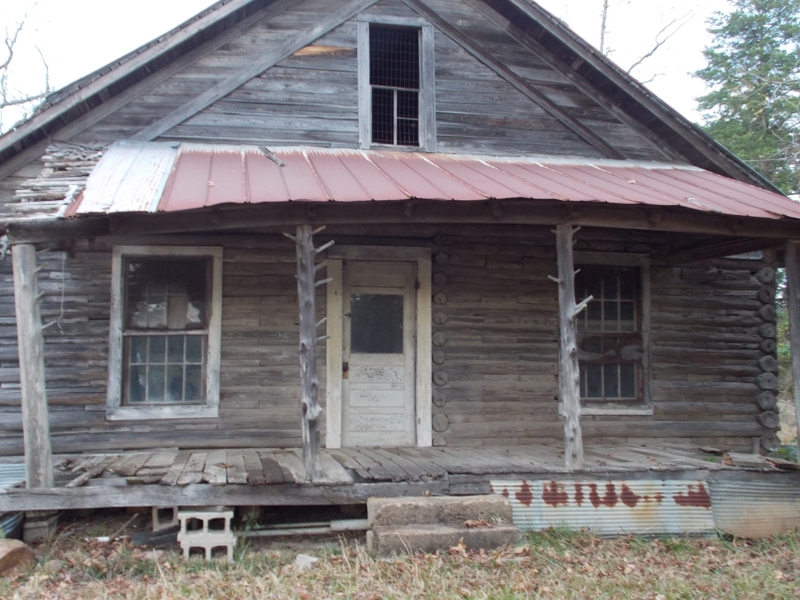 Next Mr. Evans told me about an old log cabin from the mid to late 1800s that sits next to his house. He told me that I was welcome to drive up the driveway to his house and take a look at the cabin. I was lucky to be greeted by the open and welcoming Mr. Evans. He took me inside of the cabin built from hand hewn logs. 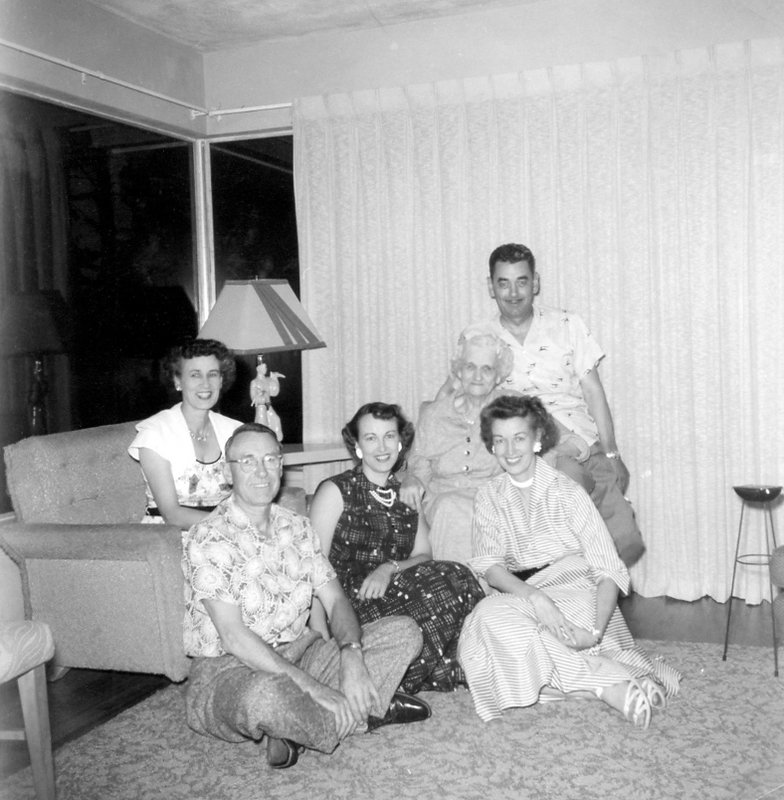 Later that day, after returning to my motel, I emailed my cousin John in Hulbert. John commented that it was very likely that my great grandfather Moses had helped build that cabin or had at least visited there. It gave me chills to think that I may have stood in the same small house as Moses. I so grateful to the owner of the land for being so welcoming to this trespasser. 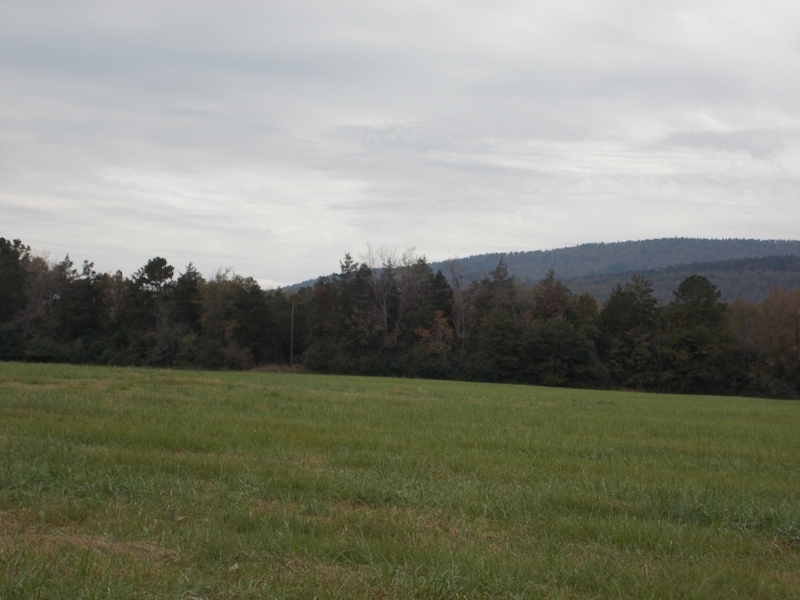 Viewing all of the land from the end of Evans road instead of the highway allowed me to really get a picture of what this land was like over a hundred years ago when my great grandfather and many other Cherokee families established a community here. Once I located and viewed my great grandfather Moses Crittenden’s homestead in Polk County Arkansas I was on a quest to find out more about Cherokee Polk County Arkansas homesteads. I headed next to the Polk County Library in Mena, Arkansas. The library has a genealogy and history room with a good selection of reference material about the early days of Polk County. Like elsewhere in Arkansas, I found little reference to Cherokee residents in the 1800s and early 1900s. This lack of recognition of the history of Cherokee settlers in Arkansas was a constant surprise on my research trip to Arkansas and will be the subject of an article in the future. I did find a few documents related to deaths and births of members of Moses’ extended family in the historical section on vital statistics in the genealogy room. After a few hours I was ready to leave when I noticed a spiral bound book in the early history of Polk County section of the library. 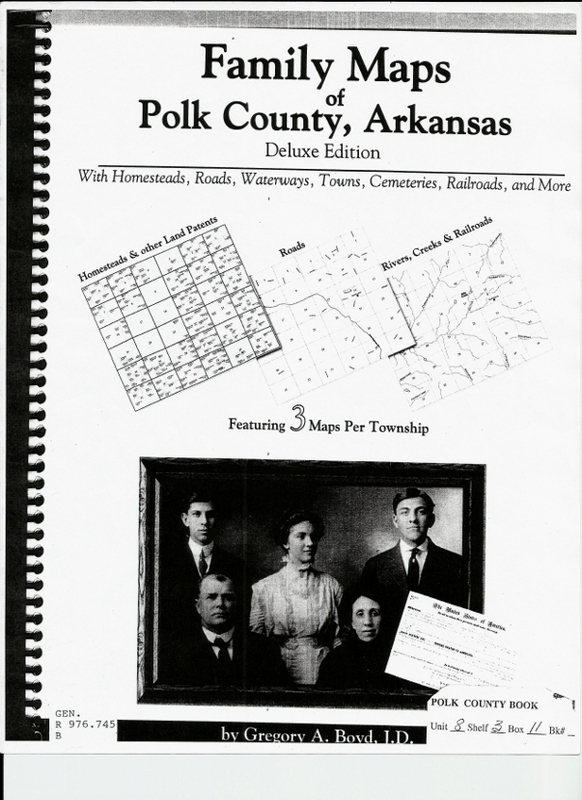 Realizing that I had not pulled that book off of the shelf yet, I found something called the “Family Maps of Polk County, Arkansas”. Looking at the cover I was assuming that inside was a history of the founding families of Polk County and where they resided. Given the lack of mention of Cherokee citizens in all the other reference materials I did not expect to find any information about my family members. So I was overwhelmed with the wealth of information that I found in this unassuming appearing book. 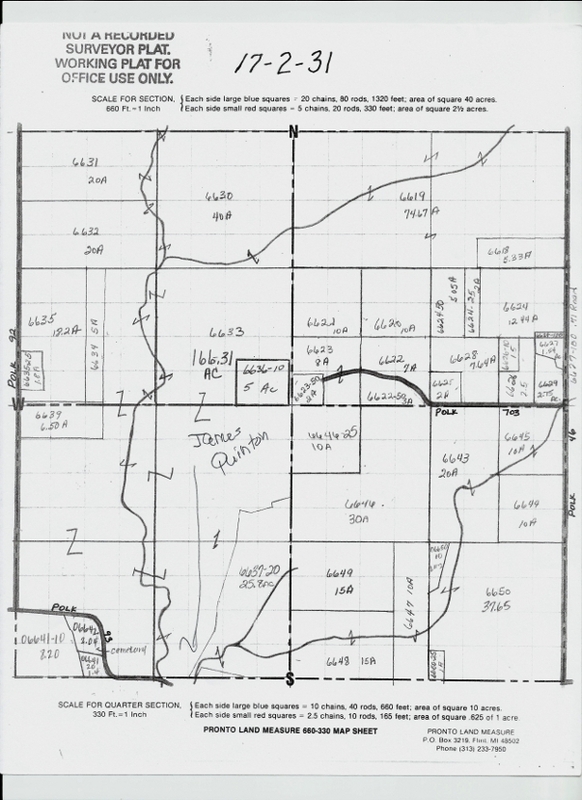 The book has detailed maps by section and range of all of the first homesteads purchased in Polk County, Arkansas. A search of the index by name found entries for Moses Crittenden and many of his extended family members. Ends up that the cemetery I had stopped at that morning to take some photos was sitting on land once owned by Thomas Quinton, first cousin of Moses’ first wife, Edith Quinton. 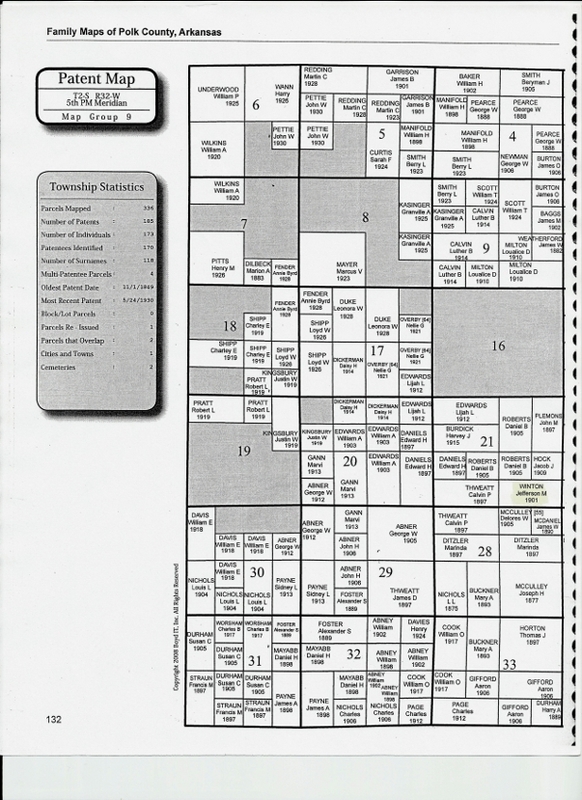 I found over two dozen homesteads of members of my extended family, some of which are highlighted in just one of the many maps. Anyone with Cherokee ancestors in Polk County Arkansas in the 1800s and early 1900s should try to get a copy of this book. My next journal entry will be about my afternoon spent driving through the land of my ancestors, an afternoon that I hold close to my heart. Note: March 13, 2019 – I just discovered that this book is available on Amazon.com. They have a paperback version or spiral bound (having used the book I would highly recommend spiral bound). They have both new and used. Christmas is all about family for me. Tonight and tomorrow will be spent with my two boys, their spouses and my grandchildren. 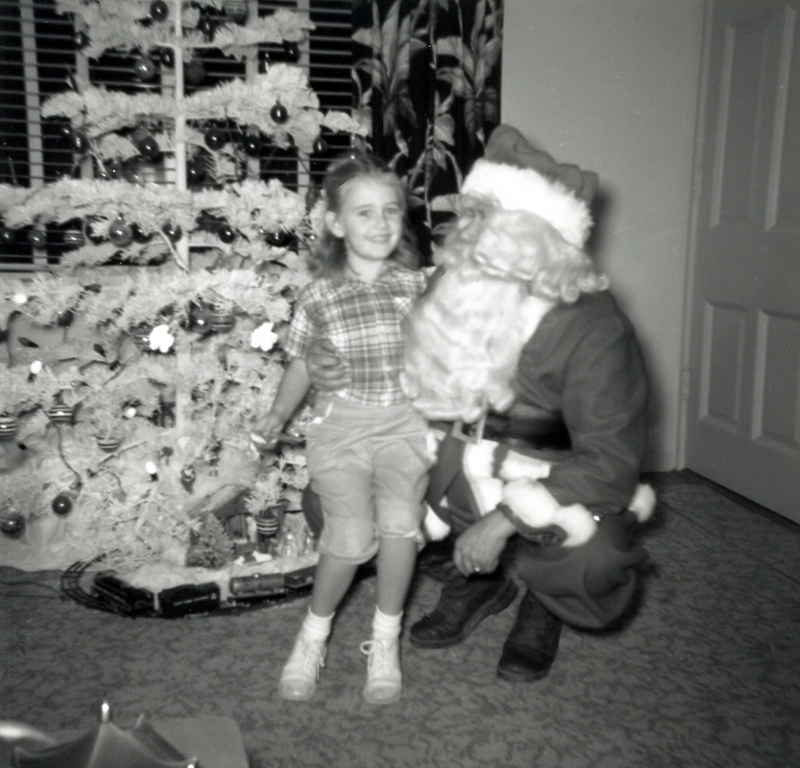 This afternoon I am remembering Christmases past with family members who are no longer with me, my dad and my grandparents. 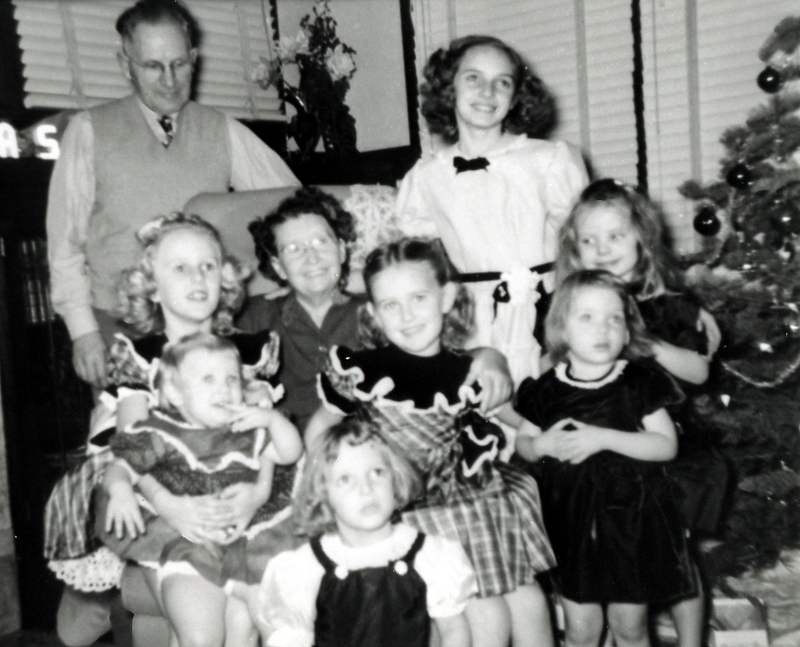 I am also thinking about my ancestors and wondering what their holidays were like. Last month I was blessed to stand on the beautiful land in Arkansas where my great grandfather Moses Crittenden, many of his relatives and other early Cherokee settlers, lived for much of the 19th century. Standing looking out over where they lived I could feel the community and lives of my ancestors surrounding me. Today I can’t help but wonder about their family holiday traditions over almost 40 years on that land. I hope they can feel the love that I send out to them this day across time and space.